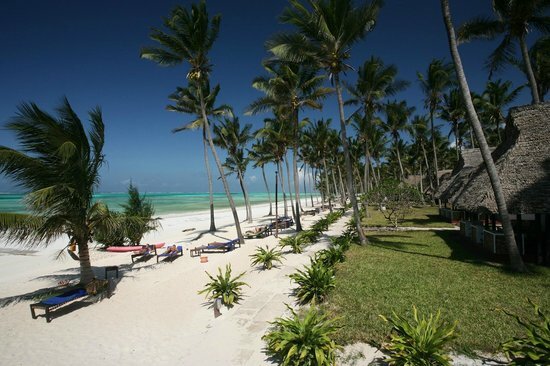 Karafuu Beach Resort: located at the east coast of Zanzibar, ideally located on a blissful stretch of palm-fringed beach with white sand and dazzling blue water – just what you’re after. 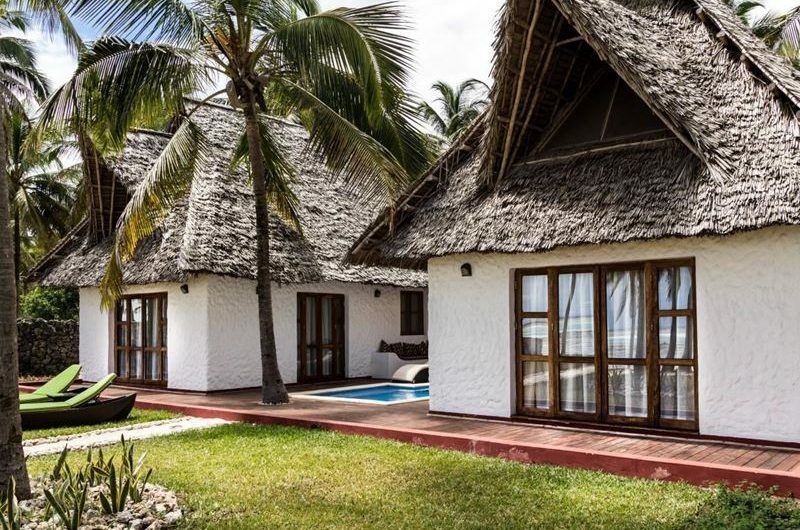 The spacious, cool reception area under makuti (palm thatch) is impressive; especially when you’re visiting the resort for the first time. There is an enormous pool around which you’ll find guests soaking up the sun. 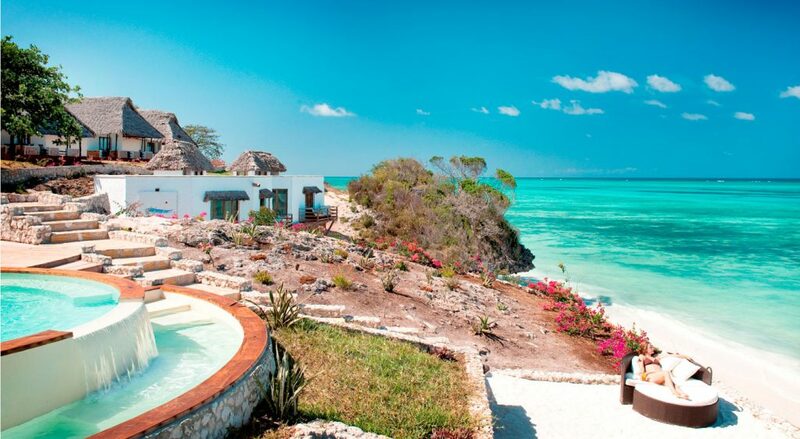 The hotel has all the expected facilities: fully-equipped Diving center, boutiques, tennis courts, Gymnasium and Spa. The eastern side of the island is greatly influenced by the tide. You can sunbathe on the beach and slip straight into the water and swim far out when the tide is high. When the tide recedes, you have to wade out to the fringing reef, which can be fun if you want to look for marine life in the shallows. 26 junior suite rooms, all with generous sea view and situated along the beachfront. 28 Garden rooms a bit smaller than the cottages, located at the top of the slope in the lush tropical gardens. All have easy access to the long stretch of beach. 20 Bondeni Rooms, located inside the “Bondeni area” which includes pool restaurant, pool bar and air-conditioned fitness centre. Situated at the top of the slope in the lush tropical gardens all facing the “bondeni swimming pool” all rooms has same dimensions of the Garden rooms and some of them have double veranda. 16 Masai Pool Rooms, completely new built near the botanic garden, around the new swimming pool. 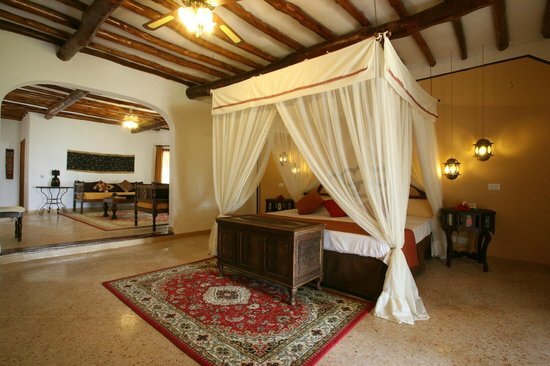 All the rooms have same dimensions of the Bondeni Rooms but they are decorated in a typical Masai style. Wi-Fi, mini-bar, telephone, tea-coffee maker, hairdryer, safe box and en-suite spacious bathroom. 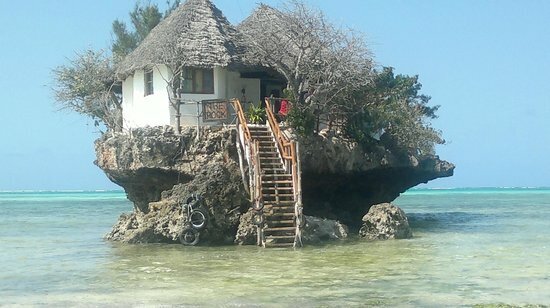 Each room has its own veranda and the beds have mosquito nets.